Formerly known as the Sun Certified Java Associate, this course provides knowledge of application development. Participants learn how to use Java SE 7. The training creates a foundation for using Java language that enables professionals to do programming. The course acquaints attendees with several concepts, such as abstraction, encapsulation and inheritance. Participants become aware about the use and manipulation of object references. They become proficient in designing and using simple Java classes that consist of loops, arrays & conditional constructs. Students additionally learn the simple coding technique for error handling. Understands the basic concept of a variable, objects & classes. I wanted one good training on Java and visited all the creditable big names. Unisoft found to be an honest place and more important they are good listeners. Within the certification curriculum they tailor it for you and you end up with more satisfaction. My Project which was my prime concern, became handy with certification and subject knowledge. i m here for studying c++ ,core java & 45 days internship. academic environment is very knowledgable. practical are taken regularly by Pratibha mam which is the requirement of industries. I am studying here Java and SQL. The concepts are cleared completely here and practicals have prime importance in this institute which is actually the need of industries. My teacher is Pratibha maam who has very clear concepts and knows how to use the technology practically. I am studying here Java and SQL. The concepts are cleared completely here and practicals have prime importance in this institute which is actually the need of industries. My teacher is Pratibha mam who has very clear concepts and knows how to use the technology practically. the teaching staff of unisoft is very good.. i really like leena mam.. she is very good as well as polite.they teach us core + advanced java.. she teaches us very well.. Akash sir.. he is also a good sir.. he teach us SQL.. he is very understanding.. we are very enjoying in this institute.. this insttute is excellent.. and teachers will clear all my doubts.. and i really enjoying there company.. this institute will develope your future ..
Roshan Hood sir(faculty for java) is really excellent.Also,good suggestion for this course is given by Pooja mam. My Experience in Unisoft Technologies is Excellent. My Faculty Mr. Shyam Nasare is good.Java Pratical and Theory sessions have been covered thoroughly.Administration department guided me good and helpfull. My experience at Unisoft Training Centre was very enlightening and helpful. From the very first day the administration had been very supportive and gave proper guidance about the course selection. My faculty for core java was Mr. Shyam Nasare who had in depth knowledge of the subject and explained the concepts very effectively. He entertained all my doubts with proper attention. Overall the experience was very good. THE CLASS WAS VERY GOOD. SIR SHYAM NASARE WAS VERY HELPFUL AND COOPERATIVE IN TEACHING THE LESSONS AND THE PRACTICAL PROGRAMS.THNXXX. Good Faculty and good Ambience I have learned C& C++ from Ms. Leena Khawshi and studying Core Java from Mr. Roshan Hood.Wide range of courses available to take up. Admin is good. The teaching of Java was very good and completed within stipulated time Period by Ms. Leena Khwashi. Unisoft Technologies has excellent professionals for teaching as well as Administrative staff. I did Java Programming SE7 Training under the guidance of faculty Ms.Leena Khawshi Madam.She Covered each and every topic in detail.Overall my Experience was very good and i learned a lot.Administration Department was helpful and Coordination and by Mrs. Savita Akolkar. I studied Java SE 7 Programming at unisoft Technologies.My Faculty for Java Programming is Mr.Roshan Hood Sir.Roshan sir taught me core java very nicely and my overall experiance was very nice.Admin team coordination and Ms. Asha Mam were good.i was guided properly. A very good institute for freshers to gain software knowledge. It was a wonderful experience to be a part of this institute. I have learnt Java Programming SE 7 from Miss.Leena Khawshi Madam and Oracle SQL 11 g from Mr. Akash Sharma sir. The Teaching Faculty is very good and supporting. The Admin member Savita Madam was very helpful and supportive. Enjoyed learning SQL and Java Programming SE 7.Faculties are friendly and cooperative.Mr. 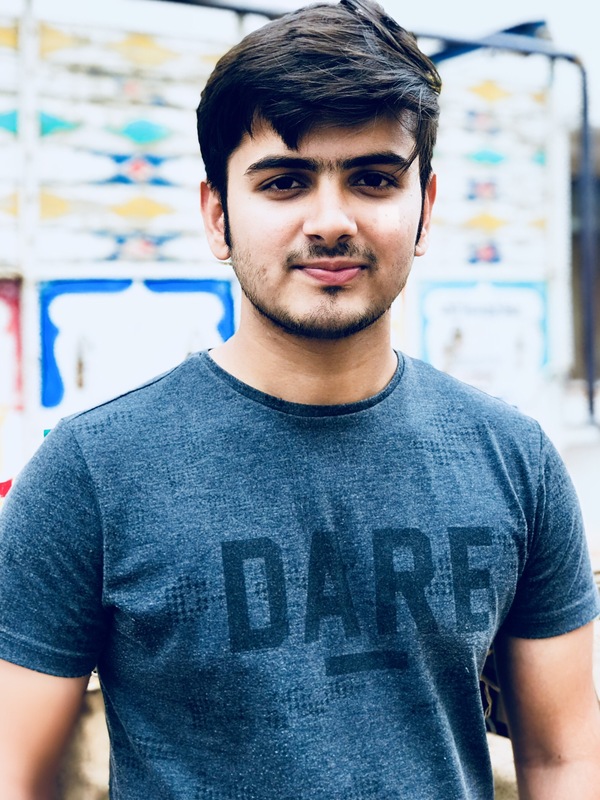 Akash Sharma and Ms. Leena Khwashi helped in achieving the required skills and kept motivating all the time.Their knowledge and teaching is worth appreciation.Also the academics staff Pooja maam and others are well guiders,helpful and motivating. Its a nice expierence for me.The whole faculty & others staff is so helpful and friendly. The institute is so nice to learn the things very easily. Also thanks to my councellor Mrs.Savita for guiding me to choose the right course at right time. Last but not the least Ms.Leena Khawsi for her teaching and support for understanding the new concepts and technology. My experience is really optimistic regarding the teaching faculty &, admin faculty(Mrs. Savita Mam & Ms. Vallery Mam). They have been always supportive in all sort of queries.Mr. Roshan Hood & Mr. Vijeet Meshram were very co-operative every time. These were the quality courses for me.Thank you. Unisoft technology is the best training center for the get start of carrier in IT industry. The admins are very helpful for giving proper suggestion and teacher staff are also best. At the time of celebrating Unisoft anniversary, I got wonderful price for lucky draw winner. Unisoft technology is the best training center for the get start of carrier in IT industry. The admins are very supportive for giving proper suggestion and teacher staff are also best. At the time of celebrating Unisoft anniversary, I got wonderful price for lucky draw winner. Unisoft Technologies is known for the best IT training institute in Nagpur, and it is. The faculties here has tremendous knowledge...and they teaches so spendidly, specially Ms. Leena khawshi mam :-). The admins and Ms savita mam here suggests the products reguarding to our qualification and guide the best career path. my faculty for core+advance java was leena khawshi mam and I had a very good learning experience under her guidance. thank you mam! I Completed my Java course from this institute.My Faculty Miss.Leena Khawashi teach me very well.I want to suggest my friends to do there IT Training from unisoft technologies.My Advicer Pooja Takshande suggest me some other courses which will help me in future .Thank you Unisoft Technologies. Excellent!! !My faculty miss leena khawshi maam is very good.she is good by heart.she teaches core java in very easy language that can easily understand. The UNISOFT TECHNOLOGIES are the best institute for software courses as compare to other institute and there teaching staff are best(Shyam sir)..! I enrolled for core java in Unisoft Dharampeth branch.In the inquiry session Vallery mam briefed me about the course contents and certification. Shyam Nasare was the faculty allotted to me. All the staff members were very co-operative. I am satisfied with the teaching as all the topics were covered in theory as well as practical . Tests were conducted and evaluated properly. Overall it was a nice experience. unisoft technologies is one of the best institute for c,c++ and java in nagpur and pune with great faculty(Shyam Sir) and admin section with great co-operation and healthy and friendly environment. Shyam sir teaches very good that I understand all the basic concepts about the Course(SE 7).The admin faculty of unisoft technologies is very good. My friend Vaibhav Choudhari referred me about this and I found this very helfpul for my career. As i had listen about the Unisoft from my friend Vaibhav Choudhari as he is having very well knowledge of java and actually he started all this things from the Unisoft. So this is the reason why i have selected Unisoft for my career in Programming Languages. Now i am Currently Learning under the a faculty Incharge for java is shyam Nasre Sir. Talking about their experience is very well as compare to other and their way of teaching is like a friend..
my teacher is shyam sir .he teaches very well with examples.he gives his output with his best knowledge . i am learning java here. study material provided is appropriate and the training given by teachers is also nice. faculty was awesome. Shyam sir teaches a good for core java. admin staff is very awesome behaviour also. enviornment as study also good. Shyam sir teaches very good, he always used to say if you have any doubt then ask it any no of times until you get that topic clearly. I joined unisoft as a trainee and intern under the guidance of Leena mam and Renu mam. Leena man taught me java , Renu mam taught me Oracle Sql and it was a great experience and i learned a lot. I was also given project to develop under guidance of Akash sir, and he was also great mentor. I would recommend others who want to become developer.. 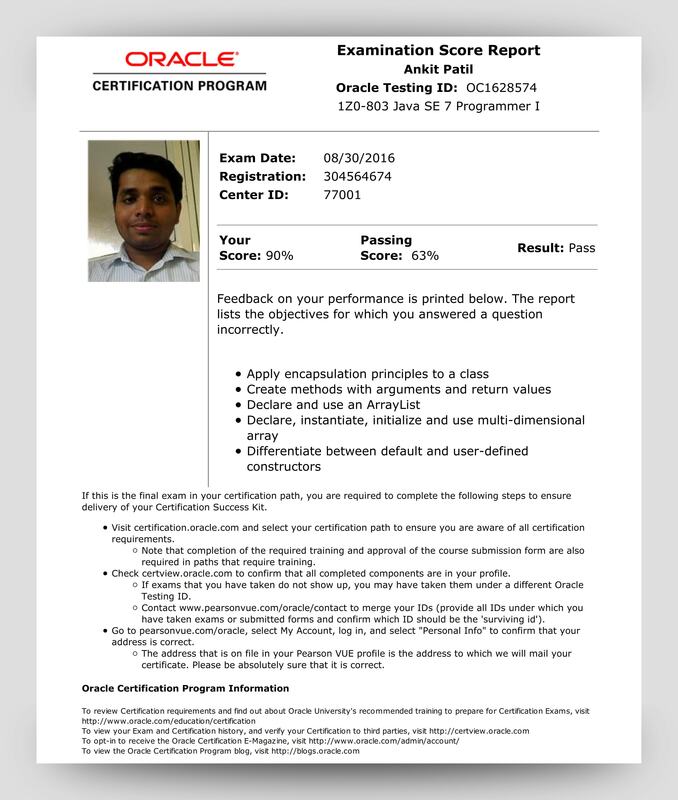 I have completed java SE7 and also OCA SE7 in Unisoft Technologies at Nagpur. My tutor was Ms. Leena Khawshi mam and she is very motivating and talented. She explains each and every concept. Teaching is exceptionally good. Full coverage is there. Very good option for the learner. I am satisfied with the training. 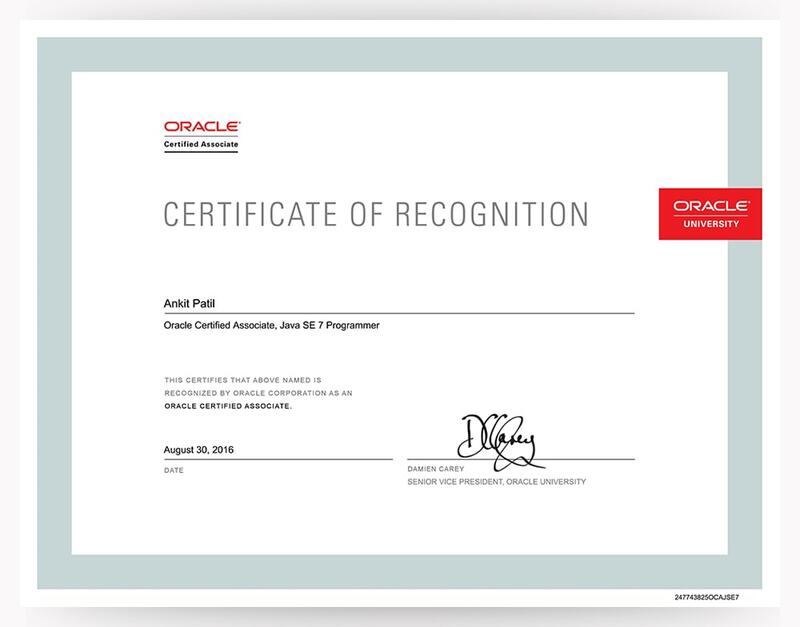 I should really thanks Admin department Ms. Sonali Morai mam for being the guide to me and helping and motivated me to get Certified in Java which i'am today as Oracle Cetified Java Associate in SE 7 Programming Thanks to faculty and Unisoft for shaping my career. i have completed the course of java from Unisoft Technologies NAGPUR .it is the best experience i had.my trainner was ms.Raina ma'am ,she was the best teacher unisoft have.she taught me c,c++ and java. unisoft provide all the material on time.i recommend Unisoft to everyone who want to start with IT career.